New music from Mount Moriah - "Calvander"
After six years, Hopscotch finally defeated me. By the time Saturday rolled around, I was dragging and for the first time I cut back on the shows I planned to attend. With my most anticipated artist, Owen Pallet, canceling for a family emergency and one in, one out situation at nearly every Moore Square area venue, I focused on catching a select few musicians. Dwight Yoakam is one of the most intriguing headliners Hopscotch has every booked. Seeing his name on the lineup invokes a “Whoa. Really?” that sends one brain into a dance to reconcile how strange and awesome it was all at once. Yoakam did not disappoint, despite some early technical issues. There were sparkling sport coats, big cowboy hats and boots, but this wasn’t a night of country at Walnut Creek. Yoakam’s music appeals to a general audience, but he keeps his roots in country and rock and roll without kowtowing to Nashville’s pop influence. Over at CAM, Raleigh’s Boulevards got off to a slow start. Jamil Rashad’s DJ, Nick Neptune, came out to hype the crowd, but the music was so soft that it sounded like the standard house music. There was some confusion. When would Boulevards come out? Was this it? 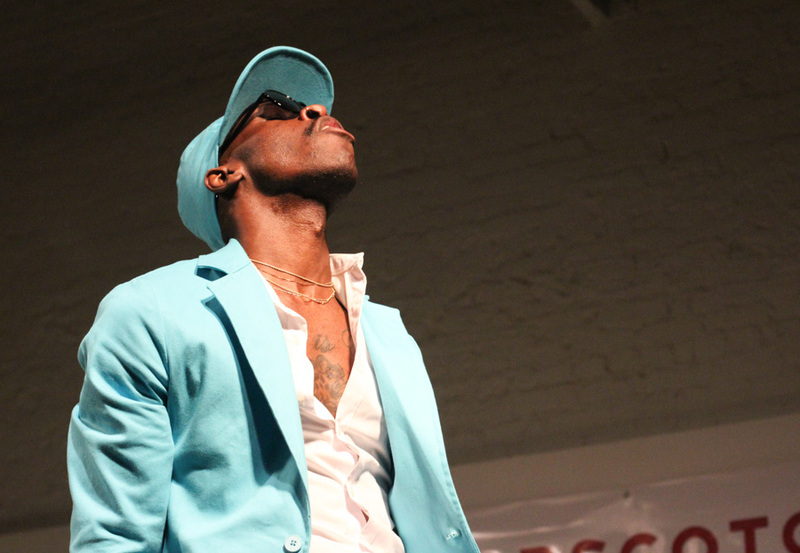 As I started to get restless, Rashad appeared decked out in a teal suit and ball cap. His mix of rap and dance music was muddy at first, but halfway through the set he kicked it into high gear. Beats became more distinct and danceable. Rashad danced in the crowd on several occasions and the whole venue started to jump up and down. It was the most energetic I’ve seen a venue before 10 p.m. There’s little doubt that Boulevards is about to be one of the most notable acts to emerge from the Oak City. The line for Birds of Avalon prevented me from getting into the Pour House to see them collaborate with improvisor in residence Greg Fox, so I settled for Choked Out at Kings. The duo is a project of electronic musicians Blursome and Eyes Low. Their gloomy grooves were augmented by plenty of special effects and sounds, making their sound off-kilter and unexpected. While more interesting than some typical dance music, it wasn’t what I needed to keep my energy up. One certainty of Hopscotch is that if you need a boost, Slim’s is a good place to find one. Sheer Mag was worth a wait in line to catch their swagger. Their 70s rock and roll is filtered through fuzz and powered by Christina Halladay’s mighty vocals. It’s the kind of music that might encourage you to take a shot you don’t need and put your around your neighbor in an attempt to fist pump together. Sheer Mag is music for when you’re drunk enough to want to shout all the classic rock you know, but still want to be cool. My final stop at the Pour House allowed me to catch the end of Zack Mexico’s set which was coming to a culmination in an epic explosion of guitars and feedback. I made it through one song of King Gizzard and the Lizard Wizard, a roaring wall of psych rock, before I had to tap out. I had my doubts, but Hopscotch did it again. There’s no doubt that once again my favorite three days of the year will be the days I spent in downtown with legions of other music fans. I learned to let go and go with the flow a bit more this year. I learned that you shouldn't judge a Hopscotch lineup before you live it.